Greeted by a hug and a warm smile, any guest to Joan’s home is considered an instant friend. It’s no surprise Joan is a “hugger.” For the past several months, her fingers have carefully weaved vibrant, colorful strings of yarn this way and that, creating the material embodiment of a hug—crocheted blankets. It’s a lost art form, a labor of love. And for Joan, crocheting blankets turned into a saving grace. In December 2013, Joan suddenly lost her husband, Ralph. Immersed in her grief, Joan coped as best she could by staying busy. “I told myself, I gotta do something,” Joan recalled. Accustomed to being busy, Joan’s no stranger to hard work. Throughout their nearly 68-year marriage, Joan and Ralph raised three boys and built seven houses on their 15-acre lake property. “I’ve done it all,” Joan explained. “I’ve been on rooftops and raised walls.” And when Ralph’s diabetes took his legs, Joan lovingly cared for him, too—until the very end. 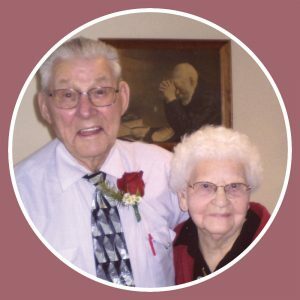 In the early morning hours of Christmas day, with Joan by his side at the lake home he so loved, Ralph peacefully passed away under the care of Hospice of the Red River Valley. Because of Ralph’s rapid decline, Joan was overcome with shock and sorrow. She began channeling her emotions into her handmade creations as a way to handle the uncertainty and loneliness of the days and months ahead. Years before, after picking up an instructional book, Joan had taught herself how to crochet. And now, her fingers and mind have found solace in the rhythmic motion of crocheting. “Making these lap robes have helped me with my grief so much,” Joan shared. To make each blanket, it takes Joan a minimum of 10 hours. 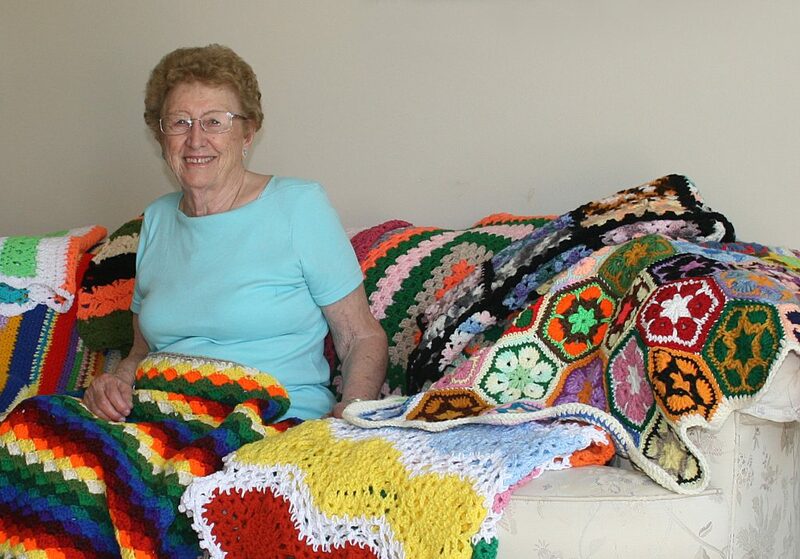 And, after hundreds of hours, several patterns and countless bundles of yarn, Joan has meticulously made 14 intricate, brightly colored, crocheted lap blankets. Adding to her homemade gifts, she made a dozen bib aprons, complete with pockets and finished with lace trim. 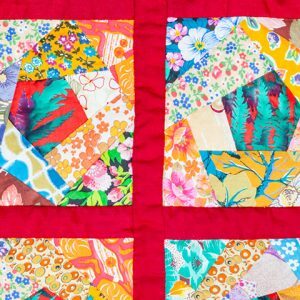 Joan decided to share her creations with Hospice of the Red River Valley by donating all of her handiwork to patients. 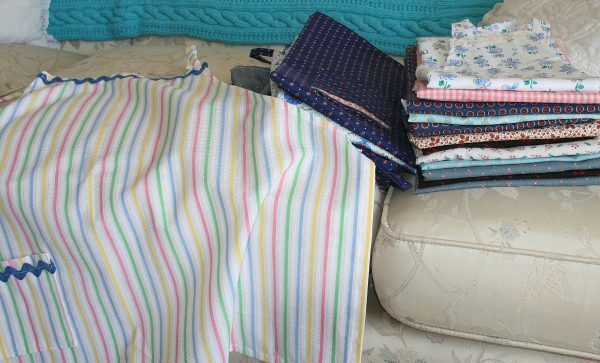 “I hope these blankets and aprons will brighten someone’s day,” Joan said. 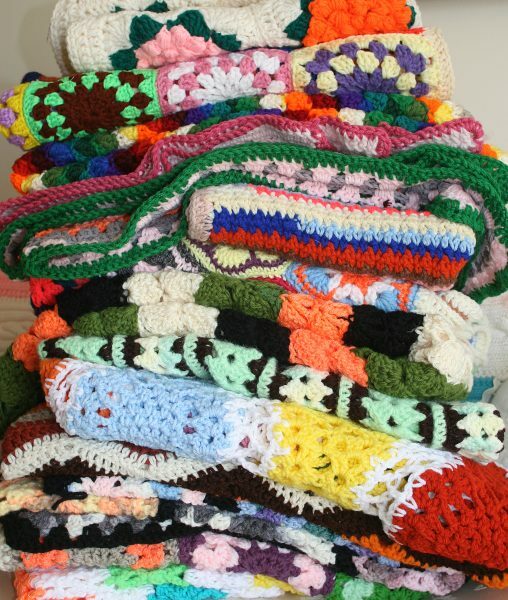 Crocheting blankets is just one of the many ways Joan copes with her grief. Even though Ralph was only cared for by Hospice for a short time, less than two days, Joan has the option to receive grief support care and resources from Hospice of the Red River Valley for 13 months. She attended a grief support group offered by Hospice and visited with a Hospice grief specialist. “It’s very helpful to visit with people with similar experiences,” Joan said of the grief support group. At age 88, Joan shows no signs of slowing down. Joan exercises three times each week at the local community center, tries her luck at the casino on Thursdays and plays games on the Internet each night before bed. “I even found some crochet patterns online,” Joan proudly shared. Joan has found herself in a “whole new life.” While she still deeply misses Ralph, she’s learned to continue on, one crocheted row at a time.